Greece has been in the news due to their inability to make payments on loans from the International Monetary Fund and the European Central Bank. With default threatening, a staring contest ensued wherein the new Greek President, Tsipras, bolstered his position by a last minute resolution. The creditors were not impressed and held firm while the Greek banks ran out of Euros. 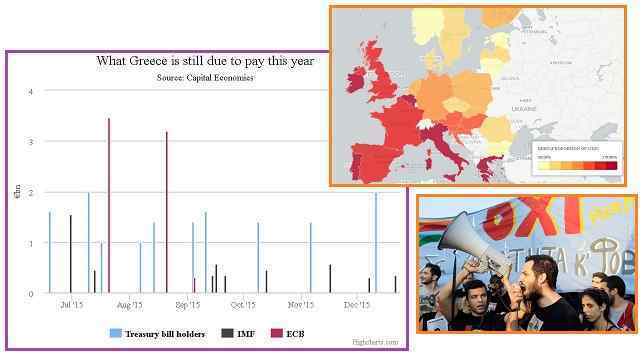 The result is yet more debt on the books and taxes in Greece being raised. ZetaTalk Comment 7/4/2015: The story of a country going bankrupt is not new, as history has many recent examples – Argentina in 2002 and Germany in 1924. The result is well known. Creditors must write off the debt, anyone holding the now worthless currency finds it falling in value, a sudden and unstoppable plunge, and those who had savings or pensions or cash set aside find all this has vaporized. Such is the lot of paper money, even if it is in electronic form these days. This story, of a country or bank or any entity going bankrupt will increasingly be in the news. The outcome is certain, though will be resisted by creditors and those who have the illusion that they are wealthy. What is seldom in the media is that Greece is not alone. Dozens of countries are at the point of bankruptcy. There has been so much attention on Greece in recent weeks, but the truth is that Greece represents only a very tiny fraction of an unprecedented global debt bomb which threatens to explode at any moment. 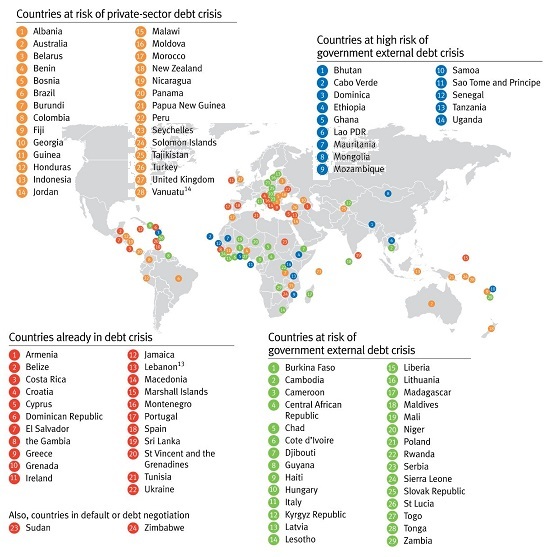 As you are about to see, there are 24 nations that are currently facing a full-blown debt crisis, and there are 14 more that are rapidly heading toward one. That breaks down to about $28,000 of debt for every man, woman and child on the entire planet. The nations of the world have never been in this much debt before, and it gets worse with each passing day. 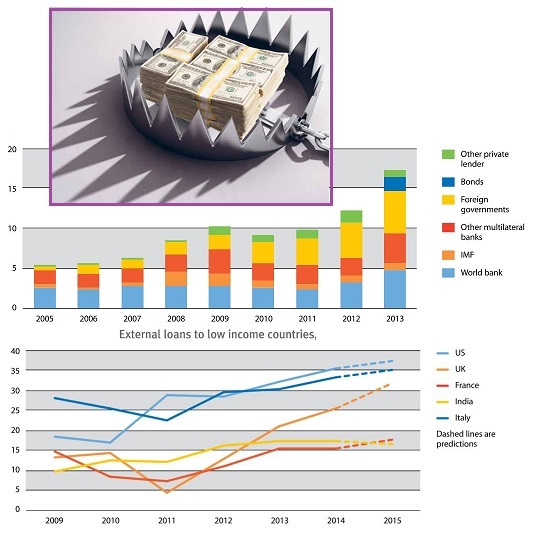 The rock-bottom interest rates across major economies, which have been a key response to the crisis, have in many cases prompted governments, firms and consumers to go on a fresh borrowing binge, storing up potential problems for the future. The lacklustre global recovery has also been a factor in driving up debt levels as policymakers seek to restore pre-crisis living standards. As Greece’s government found, debts that seem manageable one day can quickly become unsustainable the next if conditions in financial markets or the economy abruptly shift. The Zetas have long warned that the globe was in an economic depression that would not lift, and warned against sinking into debt slavery, the mechanism by which the wealthy and the banking industry would try to enslave the common man. ZetaTalk Prediction 12/15/1996: The world banks are justified in their constant fretting about the health of their industry during the panic that will occur going into the cataclysms. The worth of paper money is a fragile thing, based more on confidence than anything, paper money can plunge in value overnight, and often does in unstable countries where printing more paper money is seen as the solution to underfunding of government ambitions. History has shown that banks and the value of the dollar fall during economic depressions, and the years preceding the coming cataclysms will see crop failures in the face of atypical weather and intractable droughts, insurance company failure due to weather and earthquake severity, and a general lack of confidence. ZetaTalk Insight 1/31/2015: Where all eyes are on Greece at the moment, this is not a Greek problem. It is a problem that will afflict many countries, in fact most, shortly. Governments are tasked with collecting taxes from economic activity and disbursing this to defense and social services. As the Earth changes destroy infrastructure and impact the economy, and destroy crops so that a meal costs more, demands on shrinking funds increases. This is not going to change. More and more countries are de facto bankrupt, including the US. Due to the glut of money from the 1%, who are seeking to lend and thus invested in poor countries, and due to the history of liberal or low-interest lending practices by banking entities, the dozens of countries at the point of bankruptcy have been encouraged to sink more and more deeply into debt. An underlying cause of the most recent global financial crisis, which began in 2008, was the rise in inequality and the concentration of wealth. This made more people and countries more dependent on debt, and increased the amount of money going into speculation on risky financial assets. 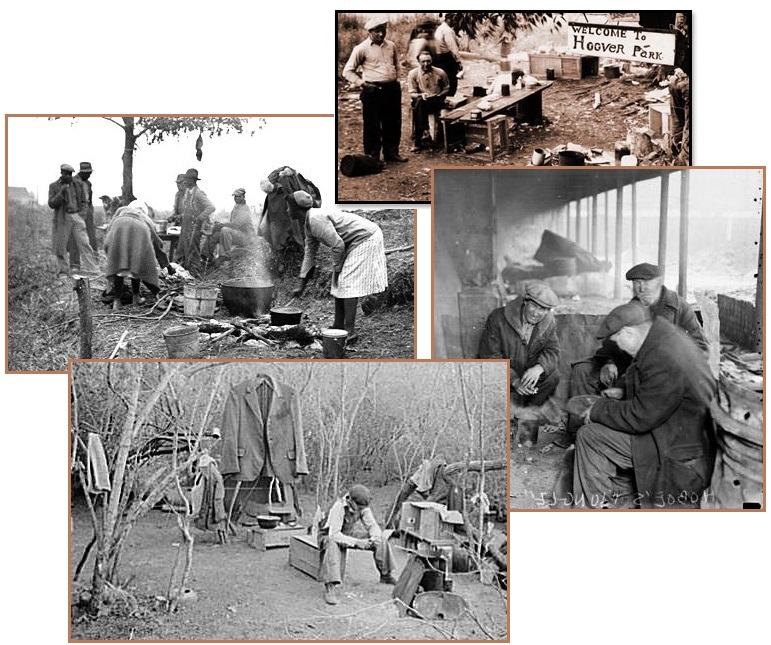 Little income was going to poorer groups in society. Meanwhile, the rich were putting more of their growing share of national income into speculative lending and risky financial investments, in search of higher returns. Rising inequality, along with financial deregulation, therefore fuelled an unsustainable boom in lending and was an underlying factor behind the crisis which began in 2008. Foreign loans to low-income country governments trebled between 2008 and 2013. ZetaTalk Statement 5/21/2011: The IMF has been used as a vehicle to enslave via debt. A country is offered loans, so they can become "developed", and then finds themselves burdened and virtually owned by this debt. The trend of late is to throw off this debt, these shackles, to wrest control back from the corporate interests that had taken ownership of the country. In that the globe is in the grip of a second Great Depression, a point of fact if not called that by the compliant media, where does this leave the IMF? Karen Hughes, a banking insider, warned of IMF ambitions and techniques over a year ago. BRICS, financial consortium formed in 2006 by Brazil, Russia, India, China and South Africa (BRICS) has a different approach. BRICS countries are on the rise, while those funded by the IMF and World Bank are sinking. 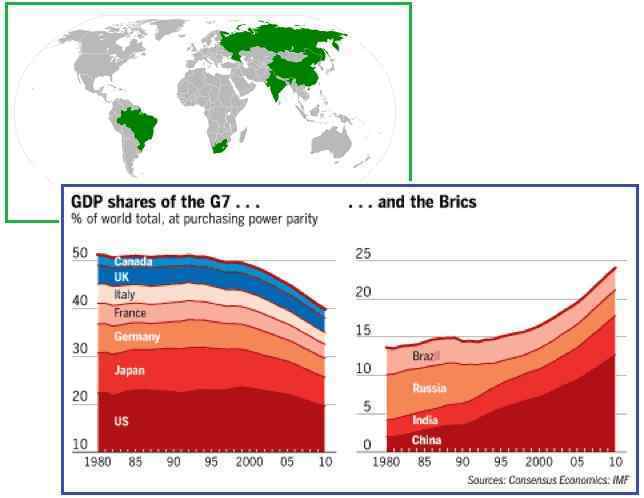 The BRICS countries have never had the colonial interest that Europe has exhibited, nor the corporate international dominance via a bloated military that the US has exhibited. Notably, Russia indicated an assist to Greece what would not be a loan but would be JOBS, in the form of a gas pipeline to be built in Greece. Where the European Central Bank was looking now for collateral on any future loans, Russia was interested not in buying Greece but in helping them recover via jobs. A different attitude. The long-heralded New Development Bank (NDB) or the BRICS Bank officially commenced business on Tuesday with the first meeting of its board of governors in Moscow. The NDB with about $50 billion in capital to invest in public infrastructure will compete with institutions where the US has considerably more influence—organizations such as the World Bank and the International Monetary Fund. The agreement was signed by the bloc’s five members — Brazil, Russia, India, China and South Africa — on July 15 last year during the sixth BRICS summit. The $100 billion BRICS Contingency Fund, that leaders from Brazil, Russia, India, China and South Africa had approved last year to combat currency crises, will be operational in 30 days. Meanwhile, the $100 billion development bank, funded by BRICS countries, will offer loans to other middle- and low-income countries. Membership of the BRICS Bank will be open to all members of the United Nations, subject to agreement from the bank’s board of governors. Where will all this lead? The Zetas have long predicted that the world will turn to the barter system, as all paper money systems collapse under the weight of debt. 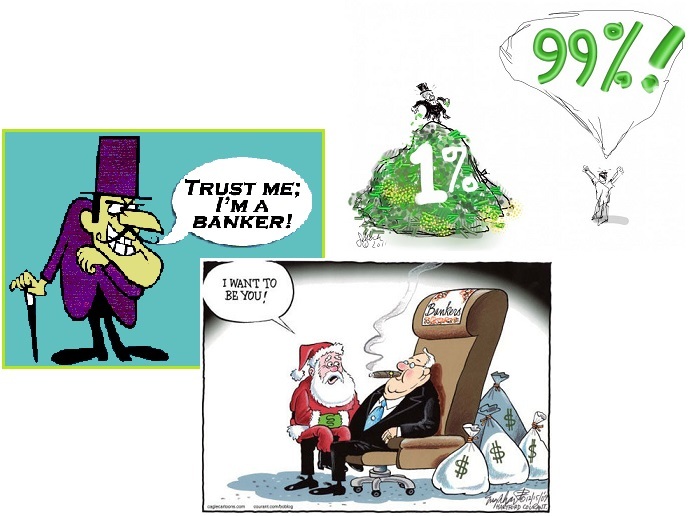 Where the 1% might today be extracting interest, blood money, from the poor they will find themselves the 0%! When the world goes bankrupt, creditors have nothing, all paper money will be worthless, and any deeds or paper ownership will not be honored in the Aftertime by survivors. Meanwhile, survivors will flourish because of helping one another, without charging interest! ZetaTalk Comment 7/4/2015: We have predicted that the world will go on the barter system. Albeit in stages, gradually and at first only in certain locales or markets. Paper money – bonds or banking balances or printed currency or credit cards – will all be dropped. They will not be honored. For the wealthy, this will be a shock to realize that they have no worth. They will expect that their lands and homes are an asset until hordes overtake them and ignore the supposed masters. They will expect that hired militias will support them until the militias take the liquor and supplies and leave the rich with nothing. The common man, quietly gardening and tending goats or chickens, will be spared this turmoil. The ATMs will be filled, although limits on cash withdrawals and on electronic transfers out of the country will likely remain. There will be some talk of new public investment, funded by the European Union; perhaps some stalled road projects will restart. But if you walk through the requirements of Greece's new program, there is another possibility. That possibility is an economic death spiral – contraction leading to banking failure, banking failure leading to contraction – first in Greece and, later on, elsewhere in Europe. Collective bargaining will be suppressed; wages will therefore fall. The state electricity company will be sold, and electric rates will rise. More people will default on their mortgages. People in Greece will line up to pull cash from the banking system. They will do this because cash avoids taxes. They will do it because any fool can see that the banks are doomed. So deposits will go down, still more loans will go bad, and the banks will continue as zombies until – at some point – the European Central Bank gives up and closes them down, this time for good. Greek depositors will then lose what little remains. The death spiral dynamic isn't necessarily limited to Greece. It could start to happen in Spain, Portugal, Ireland, and perhaps Italy. Is the public being educated on what is to come? 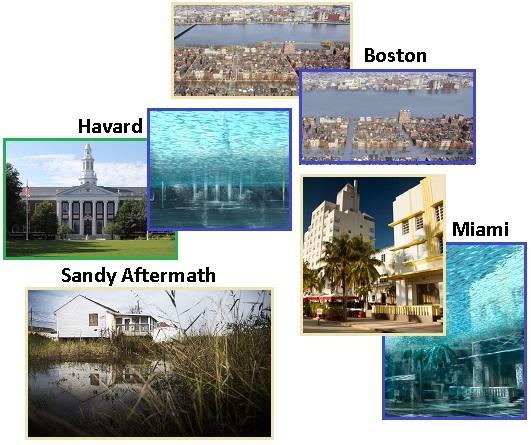 Lately possible flooding of coastal cities has been in the news. Without admitting the accuracy of ZetaTalk and the reality of the coming pole shift, the establishment can only point to flooding that human science would support. 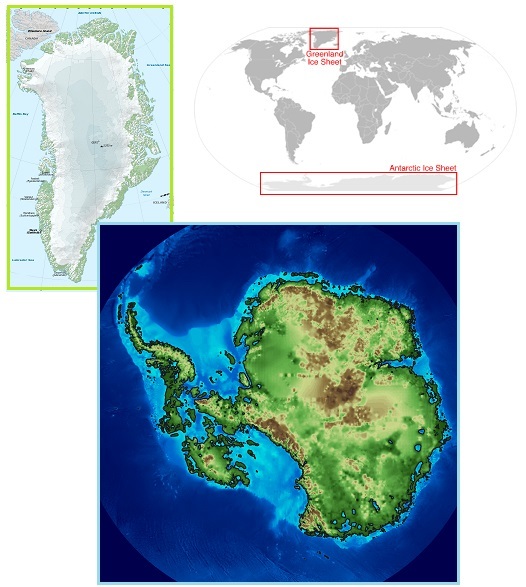 Human science states that sea level worldwide would rise 20 feet if all the ice on Greenland were to melt, and an additional 200 feet if all the ice on the poles were to melt. If the Greenland Ice Sheet melted, scientists estimate that sea level would rise about 6 meters (20 feet). If the Antarctic Ice Sheet melted, sea level would rise by about 60 meters (200 feet). If the entire 2,850,000 cubic kilometres (684,000 cu mi) of ice were to melt, it would lead to a global sea level rise of 7.2 m (24 ft). The maps here show the world as it is now, with only one difference: All the ice on land has melted and drained into the sea, raising it 216 feet and creating new shorelines for our continents and inland seas. 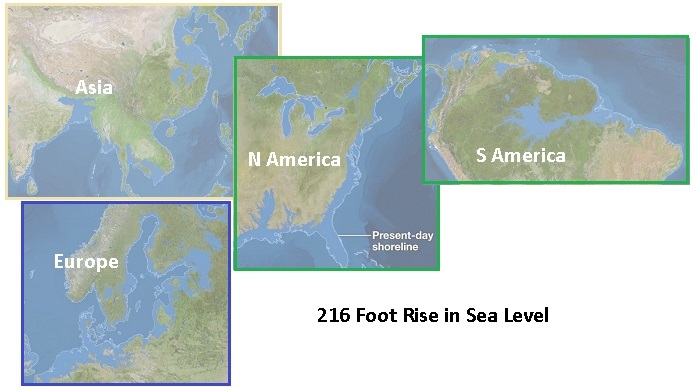 We may still see oceans creep four feet farther inland by 2100, and rise 20 feet as soon as 2200. That’s according to a new study published in the July issue of Science. Since 2012, when Hurricane Sandy brought catastrophic flooding to this neighborhood, Oakwood Beach, 99 percent of its residents have sold their homes to the state of New York. The land is to be permanently cleared, then returned to nature to become a blue-green buffer zone protecting inland communities. ZetaTalk predicts the oceans will rise an estimated 675 feet within two years after the Pole Shift, due to the friction of the moving crust generating heat which will warm the deep ocean ravines. ZetaTalk Explanation 10/5/2002: In computing the rise in the seas to 675 feet, more than the melting of Antarctic and Greenland ice is presumed, as this rise has been computed by man to be only 200 feet. What is missing from this equation is swelling of land masses, land surface under the water, as odd as this concept might sound. Metal is known to expand when heated, but the concept of hot mud being larger in volume than cold mud has not been considered, as it has never been a concern of man’s. Heat is particles in motion, and they bump atoms about so that expansion is the result. All land surface will be heated due to the swirling of the core, the heat to the extent that it can escape into the land surface doing so. The result? This surface will expand, crevasses opening, flaky layers of rock separating, and buckling occurring that creates spaces in the interior of rock. Under the oceans, this equates to a higher ocean bottom, with the water needing to go someplace, and as the bottom is moving up, the sea level can only go up also. As the public could not help but notice, there has been a long running effort to deny the alien presence. It’s all swamp gas and weather balloons, mass hysteria and hoaxes. Despite the increase in mass UFO sightings, such as the 1991 mass sighting in Mexico City during an eclipse and the 1997 Phoenix Lights sightings, it’s all denied. Despite photos of aliens increasingly popping up, and the release of the Skinny Bob video, anyone stating they think the Earth is being visited by intelligent creatures from elsewhere is deemed insane. Government programs in the US such as Project Bluebook have been funded and run for years with the sole purpose of denial. Despite polls that show that the majority of the public thinks otherwise, there are those within the government convinced that the common man could not handle the info. Many countries have opened their UFO files, and mass panic has not occurred. But with the march forward toward open disclosure, there are those willing to spend $100 million dollars to keep the illusion going. Per the Zetas, they are still afraid that the public will run screaming in the streets. Stephen Hawking announces $100 million hunt for alien life. 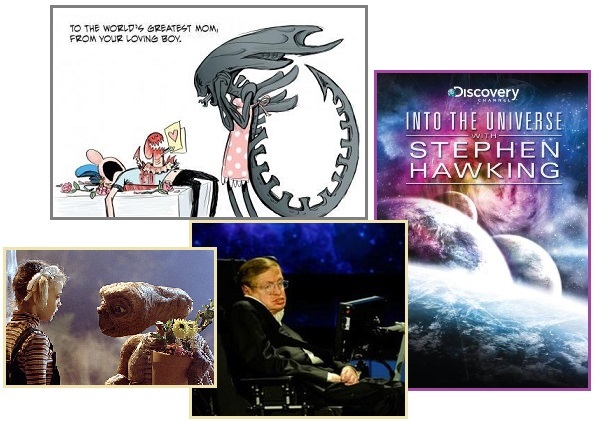 Famed physicist Stephen Hawking and Russian tycoon Yuri Milner held a news conference in London to announce their new project: injecting $100 million and a whole lot of brain power into the search for intelligent extraterrestrial life, an endeavor they're calling Breakthrough Listen. Scientists have found a surprising number of Earth-like exoplanets in recent years — rocky planets the right distance from their suns to support water — suggesting that life as we know it is at least possible, if not probable, all over the universe. The Search for Extraterrestrial Intelligence (SETI) has been active since 1960, when scientist Frank Drake — another of the great minds joining Breakthrough Listen — sought out radio signals from neighboring stars. The project will allow scientists to collect as much data on SETI in a day as they now do in a year. The data will be made available to the public, so anyone can help search for the radio signals that could be used to track down alien civilizations. ZetaTalk Insight 7/26/2015: This sudden press to search for extra-terrestrial life by a notable such as Steven Hawking is a sign that discloser on the alien presence is about to take a big leap forward. 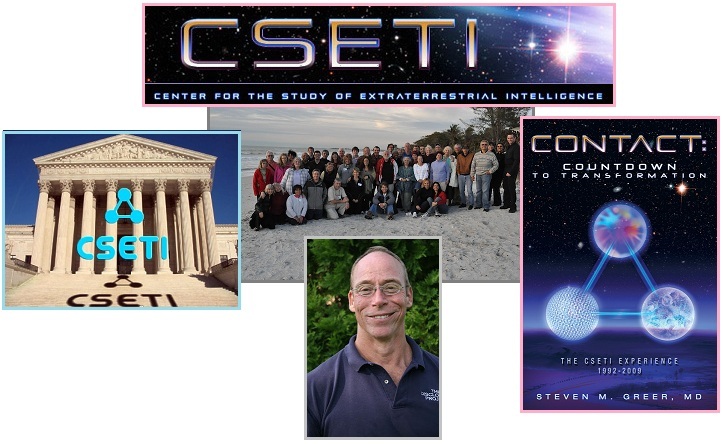 That SETI has been funded by a Russian mogul shows that the effort to provide the Element of Doubt to those that will need it is a joint international effort. Just what percentage of the populace will be unable to adjust to the concept of intelligent life from elsewhere visiting the Earth is an unknown, but that this is a concern of some elements in the US and Russia is obvious. $100,000,000 is not a small sum. SETI has been used from the start to provide the Element of Doubt, as we stated at the start of the ZetaTalk saga. Greer was recruited into the CIA program by a cancer scare. He survived, and has been on board ever since. Though he makes a profit at his seminars, he can be asked to say or do anything by the CIA and thus the claim that a mummified premature infant found in the Atacama Desert was an alien body. Hawking was recruited in 2010 to advise the public to avoid contact. If Greer is not believable anymore, Hawking presumably has credentials, and thus the comic dance will stumble forward in 2015. Indeed, Hawking began speaking about aliens in 2010, as though ability in math qualified him to speak about the alien presence. Per the Zetas, one could see what was coming next, and it has! Zetas right again! How awe-inspiring it would be to get confirmation that we are not alone in the universe, to finally speak to an alien race. Wouldn't it? Well no, according to the eminent physicist Stephen Hawking. "If aliens visit us, the outcome would be much as when Columbus landed in America, which didn't turn out well for the Native Americans," Hawking has said in a forthcoming documentary made for the Discovery Channel. He argues that, instead of trying to find and communicate with life in the cosmos, humans would be better off doing everything they can to avoid contact. ZetaTalk Insight 5/1/2010: Hearing that there are plans for partial disclosure, the CIA and their buddies determined to get out in front of this wave with more scare tactics. Thus, they recruited Hawking to mutter what he did, that aliens exist but one should not have contact as they are scary and unpredictable. Clearly, if MJ12 was in contact for decades, they are not unpredictable, but a well-known entity. Though this disclosure battle is behind the scenes, if one watches the news closely, one can see the battle lines being drawn, and even anticipate the next move. 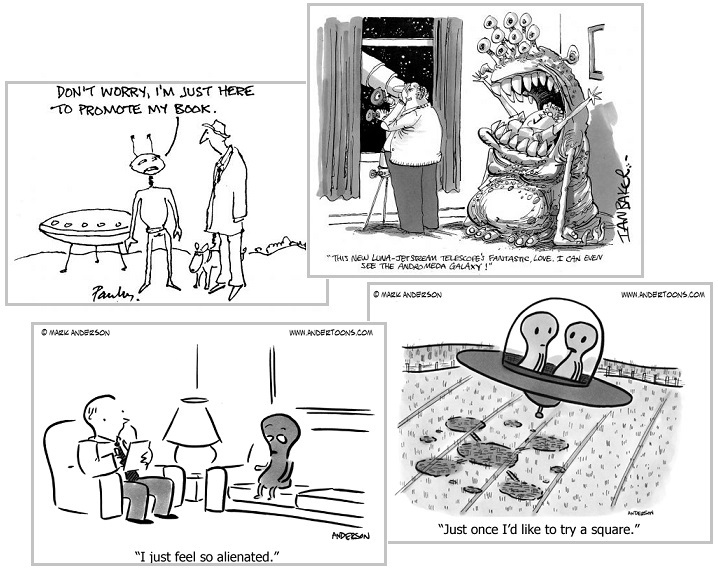 Then there is SETI, which has been a joke from the start. While the visitors are here, having tea on space ships with now well over half the world’s population, they are pretending that contact is still to occur! What? ZetaTalk Statement 10/15/1995: The absurdity of the SETI premise has been mentioned long and loudly by many - that aliens would simply use radio signals, that aliens would wait for an invitation, that the UFOs sighted regularly in the skies should not at least be factored into the program. Of course those at the helm of the SETI project know how absurd the premise is, and of course they know the alien presence exists on their planet. They are all active members of the larger MJ12 organization, and in most cases have even met aliens and canvassed alien technology. The government is leaving props for the truly anxious to cling to, and the scene of renowned scientists peering into the sky and hoping for a radio bleep makes a statement - the Earth has not yet been visited. The truly anxious can then ignore all the rest of the uproar as misguided. How long will SETI keep it up? As long as there are anxious citizens nervously querying the agencies and as long as the US government can continue to function. The coming cataclysms will surely put an end to SETI, but we expect SETI to be issuing reassurance right up to the end.